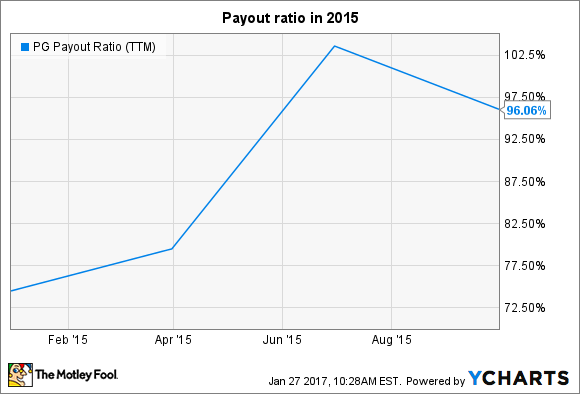 What's Procter & Gamble Co.'s Real Dividend Payout Ratio? It's likely not as bad -- or as good -- as you think. Depending on how you calculate it, Procter & Gamble (NYSE:PG) is either under intense pressure to keep its dividend growth to a minimum -- or it has room to jack the payout far higher. The gap between those results comes from the fact that P&G has shed over 100 brands from its portfolio, including massive franchises like Duracell batteries and Coty beauty products. That shift, plus dramatic foreign-currency swings, has understated its actual divided-growth potential. On the other hand, recent one-time profit surges pushed the figure too far in the other direction and suggest the company is paying out less than half of its earnings in dividends. The truth is somewhere in the middle of these extremes. The 2015 fiscal year was brutal from a profit standpoint as earnings slumped by 40% due to three factors that each pushed reported profits lower. Organic sales growth slowed as the consumer goods giant struggled with market-share losses. But weakening operating results were dwarfed by even bigger tailwinds, including foreign-currency swings and brand divestments. These trends combined to send profitability and earnings lower while pushing the payout ratio above 100%. In fiscal 2015, P&G generated $2.44 per share of reported profit and paid out $2.59 per share in dividends. PG 2015 Payout Ratio (TTM) data by YCharts. The uncomfortably high payout ratio played a key role in giving income investors their weakest dividend raise in modern history. P&G in April announced a 1% uptick to the payout, compared to 3% in 2015 and 7% in each of the prior three calendar years. More recent results paint a brighter picture for P&G's dividend coverage. Reported earnings over the past six months are up 90%, to nearly $4 per share. That makes the company's $1.34 per-share dividend over the period look easily affordable, and in fact has pushed its trailing-12-month payout ratio back below 50%. PG Payout Ratio (TTM) data by YCharts. Yet investors shouldn't rely on that figure, either. P&G last quarter booked a one-time gain of nearly $2 per share in profit from the sale of its beauty product line. That was the main reason why net earnings more than doubled, to nearly $8 billion. 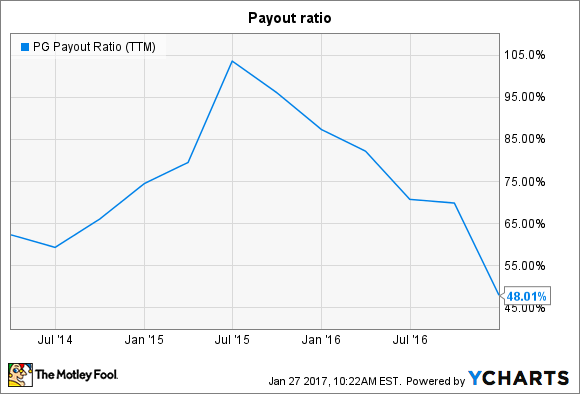 A better way to calculate the payout ratio right now would be to use earnings from continuing operations rather than reported net earnings. By that measure, P&G is currently dedicating roughly two-thirds of profits to dividends, which is on par with some of its lowest results in recent years. Dividend as a percentage of earnings from continuing operations. Chart by author. Data source: P&G financial filings. That's not the only hopeful sign for income investors that stronger dividend growth is on the way. P&G's core operating margin is marching higher now, too, and its sales expansion pace is finally starting to show signs of solid momentum. The company is expecting to book 2.5% organic growth, marking a nice improvement over the prior year's 1% and putting it ahead of rival Kimberly-Clark (NYSE:KMB) for the first time in years. Kimberly-Clark doesn't have the same operating drag that has pushed reported profits lower for P&G. Thus, the company can be more generous with its dividend commitments, which is why it recently boosted its dividend by 5.4% for the 2017 fiscal year. P&G typically makes its dividend announcement in the spring, and there's every reason for income investors to expect a more substantial raise than last year's 1%. Still, the company is likely to lean more heavily on stock buybacks as the preferred channel for cash returns to shareholders, at least until core earnings growth returns to a consistent mid-single-digit pace under the new operating structure.